The size and complexity of software in spacecraft is increasing exponentially, and this trend complicates its validation within the context of the overall spacecraft system. Current validation methods are labour-intensive as they rely on manual analysis, review and inspection. 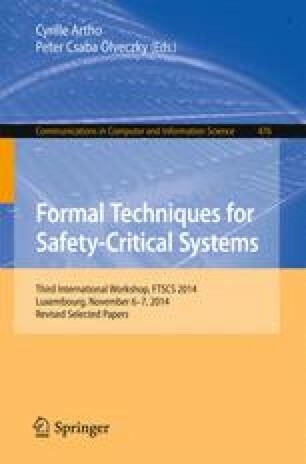 In this paper we give an overview of an integrated system-software co-engineering approach focusing on a coherent set of specification and analysis techniques for evaluation of system-level correctness, safety, dependability and performability of on-board computer-based aerospace systems. It features both a tailored modelling language and toolset for supporting (semi-)automated validation activities. Our modelling language is a dialect of the Architecture Analysis and Design Language, AADL, and enables engineers to specify the system, the software, and their reliability aspects. The COMPASS toolset employs state-of-the-art model checking techniques, both qualitative and probabilistic, for the analysis of requirements related to functional correctness, safety, dependability and performance. We thank all co-workers in the COMPASS project for their contributions, including the groups of Alessandro Cimatti (FBK, Trento, IT), Xavier Olive (Thales Alenia Space, FR), David Lesens (Airbus Defence and Space, FR) and Yuri Yushtein (ESA/ESTEC, NL). This research has been funded by the European Space Agency via several grants.